It was when I was hunting a Great Jagras for a second time in Monster Hunter: World that something just clicked. Despite it being an action-RPG that isn’t afraid to make things a bit trickier than other games out there, Monster Hunter: World is an incredibly calming and satisfying game, and will easily be up there as one of the best games of 2018. 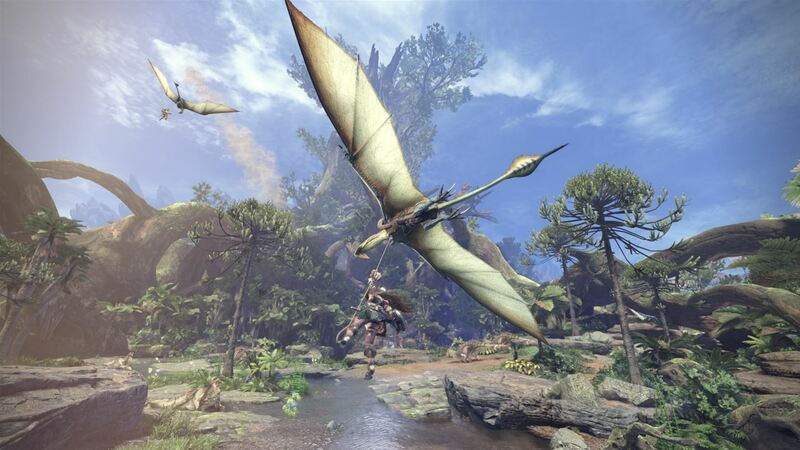 MHW is the next instalment in the long running Monster Hunter franchise but, up until this release, many had been hidden away on handheld devices, or not released in the West at all. After this release though, I can’t see that being the case anymore. 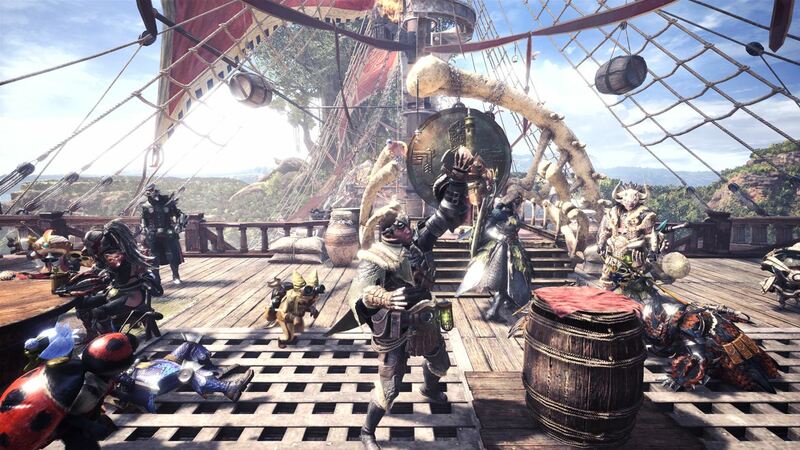 Monster Hunter opens with a group of hunters called the Fifth Fleet travelling over to The New World and tasked with making it habitable. During this voyage you can create your character and AI companion, known as a Palico. Palicoes are a cat-like companion that will aid you across each and every mission you take on, providing you are playing as a solo player or as a duo. If three or four people are in a party together, then the AI Palico is left on the sub’s bench. My only criticism with my Palico is that it is a cat, and I am far more of a dog person. Such is the excellence of MHW though, that this is one of my biggest issues with the game. Unsurprisingly, the voyage over to The New World does not go according to plan and the ship you are in comes under attack from an elder dragon known as Zorah Magdaros. These elder dragons also make the pilgrimage over to The New World and your main quest throughout MHW is to find out exactly why. The story is used to link hunts and expeditions together into a longer narrative and is overall a more engrossing tale than I was expecting. I was also not expecting how immersive the game world is. Headphones in – fantastic soundtrack and all – and it’s easy to get sucked in completely. Ancient Forest, the first area you visit, is a lush and densely packed area and you could quite happily spend a few hours exploring round. The same goes for all the other areas, but those are on average a higher level of difficulty. 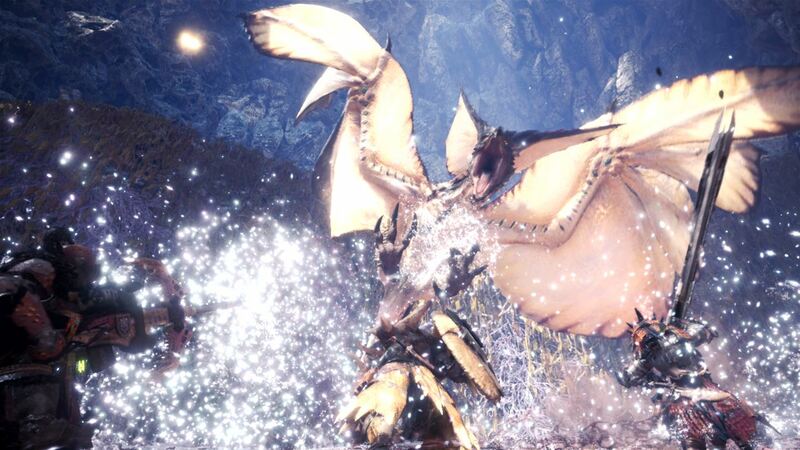 When you finally make it to the main hub area known as Astera, you have already encountered a few monsters and the game does an excellent job of showing you how far down the pecking order you are compared to these brutes. It isn’t long though before you are thrown back out to the huge, open-world areas to thin their numbers. Each of these are incredibly diverse offerings, with much variation in appearance. They also offer untold amounts of items to forage that at first will overwhelm you with just how much there is. Within a few hours however, you will have developed your own style and will therefore know which items are of use to your unique character. This customisation extends past which collectibles to gather up, and plays a major part in the gameplay cycle of MHW. As players hunt the monsters, loot will be gathered from the corpse of the animal which is then used to forge weapons and armour to make the player stronger. 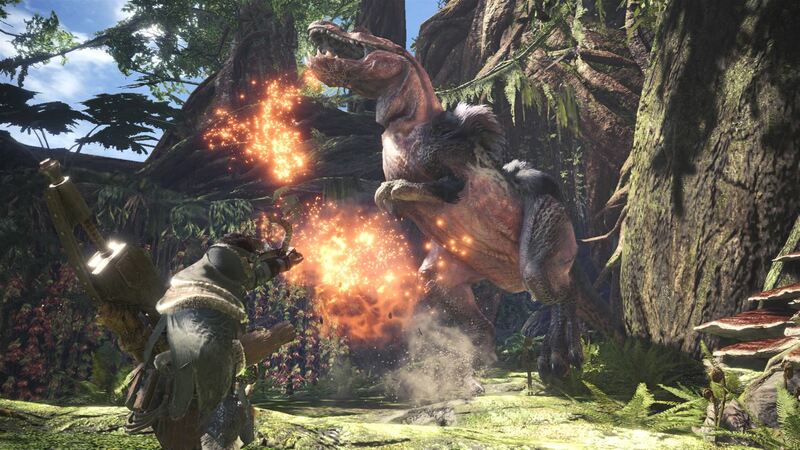 The stronger player then has access to harder and more difficult hunts where – once culled – loot can once again be gathered to craft the next set of weapons. Don’t let this put you off – words cannot do this addictive cycle justice to how satisfying it is. Nothing beats the feeling of completing your first successful hunt, except for maybe the next few hundred hunts. It’s because every single fight is different due to the way the monster AI is designed; if one monster has taken a particularly bad pasting, they will dash off to another area to create some space. They could though, run into another, more powerful monster themselves, leaving you a moment of respite as you watch this epic brawl continue. Monster Hunter: World also features multiplayer across the entire game, but it can be a little confusing as you try to team up with online friends. Firstly, an online session needs to either be created or joined. These all have a unique online ID code that you can then inform friends or other members of your squad of, and they need to then input the code to be able to join the online session. That is, when the online servers are working as they should be. Xbox One owners are still having difficulty pairing up online. For those put off by the multiplayer issues, then thankfully the entire game can be completed by a single player, and it remains fun. When it does work through, the thrill and excitement is exponentially increased. The difficulty of the fights goes up related to how many players are partaking in the quest, up to a maximum of four. But it is watching the other players all at work, using their personal tactics and fighting moves to take the beast down that is the biggest thrill. More than once I have stood watching the vast range of weapons in use when I should have been helping. In my defence, there are 14 different types of weapons to choose from, and they all perform wildly different. They include a sword and shield combo designed for beginners, longer range weapons that fire bullets, a sword that transforms into an axe that upon impact can cause explosions, to a one literally made from the spines of some of the monsters. Early on in the game it is less important which tool of destruction you choose but with later, end-game monsters, it can mean the difference between success and failure. But even when I did fail, I knew where I went wrong and jumped straight back in to whatever quest it was, learning from those mistakes. I could not only feel my character, but also myself, getting stronger and better at the game throughout and this was never due to a lucky loot-based drop or dodgy AI. Every hunt and capture will need to be worked hard for, and you will be duly rewarded for doing so. Speaking of rewards, as with most Capcom games, the achievement list isn’t for the feint-hearted. So much so that completion estimations currently have no firm evidence – mainly due to the lack of actual global completions. 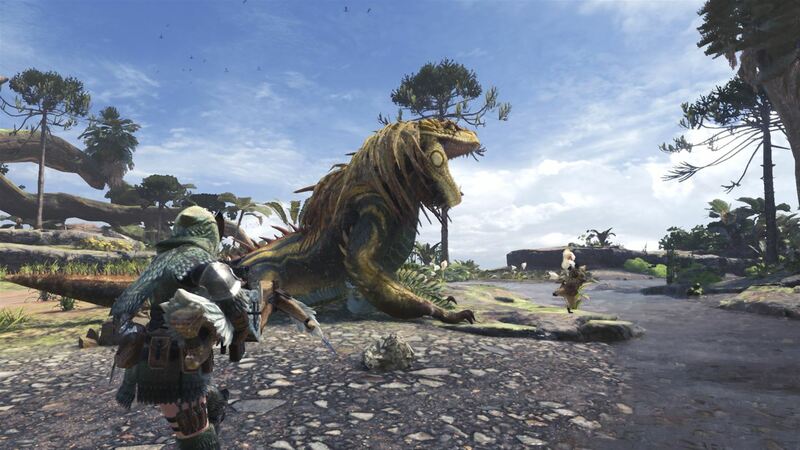 There are a couple of juicy ones in the list such as reaching Hunter Rank 100 (after around 25 hours in, I am rank 9), but the ones causing the biggest headaches are for earning crowns related to hunting small and large versions of the beasts in the game. As these are completely random and down to luck this could take a very long time. For example, in those 25 hours I have put in, I haven’t unlocked a single achievement related to big or small monsters, and there are 6 in total. At this stage, I am not even close to completing MHW, nor do I want to be. I want to keep hunting and keep crafting, and there are quite obviously hundreds of hours of content available for me to be able to do this without being anywhere close to bored. Obvious comparisons to other games such as Destiny, Warframe and The Division can be made, but MHW leaves them all trailing far behind in terms of content and sheer enjoyment. Um... cats instead of dogs!?! Next articleIt’s not Dig Dug, it’s Dig Dog – and it’s available right now on Xbox One, PC and iOS at a super cheap price!